Charles Dance as Tywin Lannister. Image: © HBO Promotional Images. Game of Thrones promise for Season 4? Lots of excitement, intrigue, more powerful characters, and perhaps, finally, the hope of somebody repaying the Lannisters for all the harm they’ve caused. But underlying all of that, Season 4 promises a deeper dive into war’s moral quandary. The trailer suggests the themes in the first four A Song of Fire and Ice novels—all named after various aspects of succession wars—will be more fully realized: war, revenge, justice. War and the hollow quest for power is the principal theme in George RR Martin’s series. The nobles fight over a throne made of the deads’ swords while the true threat approaches: what’s on the other side of the Wall. Game of Thrones’ Long Winter is a double-metaphor. Winter is, of course, symbolic of death. But, in this case, the dead—the wights—are awakened (quite literally) and on the march. Game of Thrones makes flesh the most important problem in the Hundred Years’ War period—the Little Ice Age and its cold, crop failures, and famine that occurred while the nobles fought for a hollow crown. The Season 4 trailer begins with the narcissistic and self-deluded king Joffrey explaining why his subjects love him: “They know I saved the city; I won the war.” But, the images send another message. 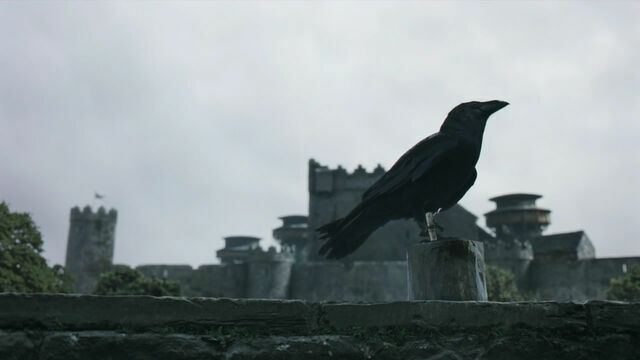 The trailer cuts to crows picking the fallen’s bones on a battlefield—there are no winners in war — and, as Joffrey’s father Jaime reminds the king, the war is not over yet. Hey Laura! Nice to hear from you! You’re most welcome! !